A label says, “best if used by Dec., 27, 2019. Is a “Best If Used By” date a “safety” date? Which of the following foods is “hormone free”? Which animal is raised with “added” hormones? If “bananas-A” are labeled “GMO-Free” and “bananas-B” have no GMO labeling, which is a TRUE statement? a. Whole wheat. Ingredients are listed by their common or usual name in descending order by weight. 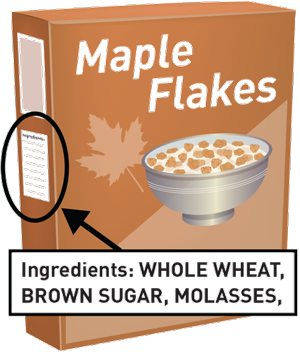 For example: If “whole wheat” is listed first, that ingredient is found in the largest amount by weight in the product. The ingredient listed last contributes the least amount by weight. a. No. A “Best If Used By” date describes product quality, where the product may not taste or perform as expected but is safe to use or consume. d. None of them are “hormone free.” Anything that is or has been alive contains hormones, including plants. There is no such thing as “hormone free” meat or animal product. d. Neither of them. Added hormones aren’t allowed by the U.S. Department of Agriculture in pork and poultry. A claim of “no hormones added” on pork or poultry must be followed by the statement, “Federal regulations prohibit the use of hormones.” Be aware, the claim of “no hormones added” may be in much larger letters than the statement saying the use of hormones is prohibited. b. Neither of them are GMO foods. In today’s market place, you may find foods promoted as “GMO free” or “contains no GMOs.” Before you pay extra for this food, be aware it may not be made with any ingredients that contain GMOs in the first place. In other words, the same type of food without that label may also be free of GMO ingredients. NOTE: Not all versions of all these foods are genetically engineered. Artic apples will be available in some areas by 2017. Before being placed on the market, genetically modified foods must be approved by the U.S. Food and Drug Administration, the U.S. Department of Agriculture and the Environmental Protection Agency. For more information or to view a self-paced slideshow on labeling, go to UNL’s food webpage.